Heat oven to 400°F. In 2 1/2-quart saucepan, heat water and butter to rolling boil. Stir in flour. Stir vigorously over low heat about 1 minute or until mixture forms a ball; remove from heat. Beat in eggs, all at once; continue beating until smooth. Drop dough by scant 1/4 cupfuls about 3 inches apart onto ungreased cookie sheet. Bake 35 to 40 minutes or until puffed and golden. Cool away from draft. Meanwhile, in large bowl, beat all Eggnog Cream ingredients except cream with electric mixer on low speed 1 to 2 minutes or until smooth. Add cream. Beat on high speed 1 to 2 minutes or until soft peaks form. Cut off tops of cooled puffs; pull out any soft dough. Fill puffs with Eggnog Cream; replace tops. Sprinkle with powdered sugar. Serve immediately. Store covered in refrigerator. 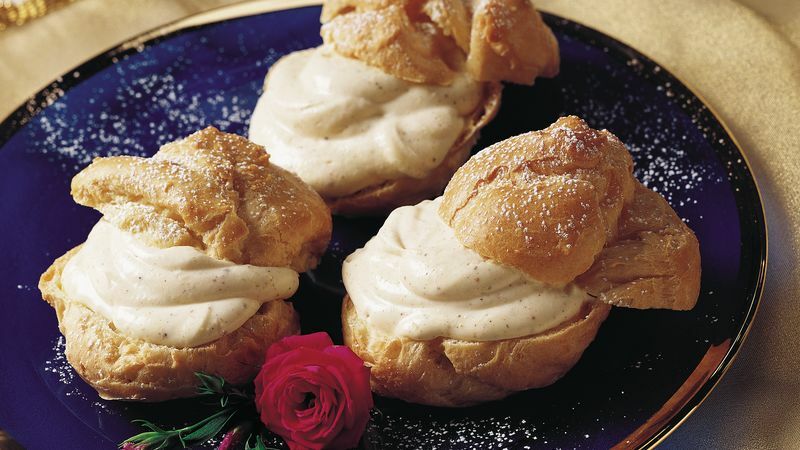 Fill the cream puffs, cover and refrigerate up to 3 hours. Sprinkle with powdered sugar just before serving. Instead of sprinkling the cream puffs with powdered sugar, brush the tops with light corn syrup and sprinkle with colored sugar or nonpareils.